Synopsis: Perfect for the fans of Shatter Me who are desperately awaiting the release of Unravel Me, this novella-length digital original will bridge the gap between these two novels from the perspective of the villain we all love to hate, Warner, the ruthless leader of Sector 45. 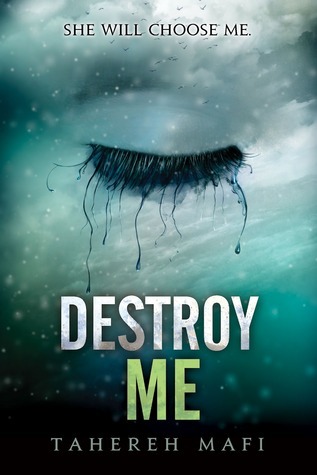 Set after Shatter Me and before its forthcoming sequel, Unravel Me, Destroy Me is a novella told from the ruthless leader of Sector 45. This book, OH MY GOD this BOOK. I effing love Destroy Me. Getting inside Warner's head was everything and nothing like I expected it to be. Getting to know Warner and understanding his motivations was completely exhilarating. He is methodical and sure and smart and very much human and flawed. I became enamored with him. We learn a lot about why Warner is the way he is and I found myself swooning over him a lot. The way he feels about Juliette and how he realizes how much he cares about her just about killed me. I'm a little bit jealous and I wish I had a guy that want to know me as much as Warner want to know Juliette. Tahereh Mafi managed to blow me away with her writing style all over again. She has a unique way with words that just utterly captivates me. What I wouldn't give to be able to write like her. "I've been Dalalieu," I manage to say. I open my eyes. Look into his watery ones. "I haven't gone deaf." "They said that as long as I stay in bed this week, the new drugs they've given me should accelerate my healing process...I told them it was an interesting theory." "If it were nothing but sexual attraction I'm sure I would not suffer such unbearable humiliation. But I wanted so much more than her body." "And even though she hates me, I can't help but be fascinated by her. I'm enchanted by her pretend-innocence; jealous, even, of the power she wields so unwittingly. I want so much to be a part of her world. I want to know what it's like to be in her mind, to feel what she feels." "But watching her talk to someone else made me crazy. I was jealous. Ridiculous. I wanted her to know me; I wanted her to talk to me. And I felt it then: this strange, inexplicable sense that she might be the only person in the world I could really care about." "Most days I feel just as caged as these civilians; and that's likely why I always come here. It's like running from one prison to another; an existence wherein there is no relief, no refuge. Where even my own mind is a traitor"
"Every nerve ending in body is awake. I've never felt so alive or so desperate in my life, and I'm sure if she could hear what I'm thinking right now, she'd run out the door and never come back. Because I want her. Now. Here. Everywhere. I want nothing between us. I want her clothes off and the lights on and I want to study her. I want to unzip her out of this dress and take my time with every inch of her. I can't help but my need to just stare; to know her and her features: the slope of her nose, the curve of her lips, the line of her jaw. I want to run my fingertips across the soft skin of her neck and trace it all the way down. I want to feel the weight of her pressed against me, wrapped around me." I am SOOO looking forward to Unravel Me, but now I don't know how I will survive until February after this glimpse into Warner's mind. I'm going to have to make time and reread Shatter Me so I can remember why I like Adam in the first place. Warner definitely has me on his team.